Quote Reply Topic: MERS Prevention - Masks? It's been a long time since i personally researched the best mask to use. This forum has a lot of good info on them. In a nutshell - anyone have a suggestion on the BEST and most effective mask? Utwig and a few others here were discussing the possible reason for the tilt in MERS infections heavily toward men, and that very few women have gotten it. A theory was discussed about how women in the Middle East generally wear veils, which could be offering them some protection, similar to a sort of mask. Although it's pure speculation at this points, it's about the only thing that makes sense. Therefore, it might be worth researching as MERS is transmitted in close contact and it's not airborne. Since it's not airborne and requires close contact via droplets, a mask will prevent the infection - at this stage. Feel free to post any information, suggestions and recommendations about masks. 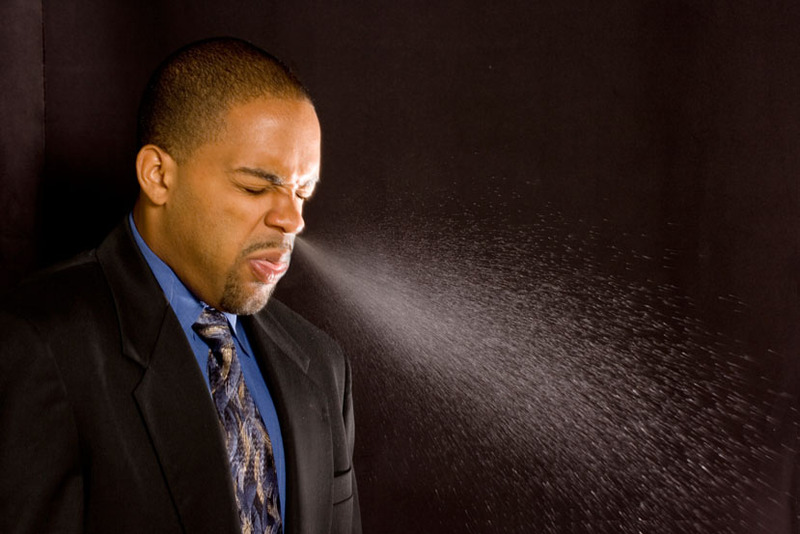 •	4.2 log reduction in Human Influenza Virus Type A (10-minute test). Antibacterial, antiviral and anti-fungal action was not diminished by hot ironing nor by rinsing in water or machine washing 20 times. The Product meets accepted criteria for a disinfectant and viricide according to Australian Therapeutic Goods Order Number 54/54A. Personally, I like the original Virogard mask as it can be worn for extended periods without discomfort and offers lower breathing resistance than the P2 model. original SARS outbreak. I like this mask because of the fluid shield, which stops moisture (perspiration) from entering the mask and because it has a large breathing pocket. I give this mask a high rating because it is also available in children's size. This N95 mask is also on my list because it comes in children's, medium and large sizes. It is crushproof and offers a good facial seal. This N95 was also deployed with success during the original SARS outbreak. It is still a popular choice among the medical fraternity. These 99.9% effective against most flu viruses and it kills them to boot. Available at wallgreens. Outside of a negative pressure respirator with a NBC filter this is what I would use. Good info Rickster and Lopper. Last option is using Rishat's blood as a vaccine. Huge Question! I would purchase a full face respirator but WHAT Cartridges do I use???? This has been a big problem for me. I have looked at 3M respirators for a long time I just never knew what to use to keep viruses out. If there are better full face respirators please tell me. "Last option is using Rishat's blood as a vaccine"
Too late. I have a patent on it. FluMom - you can buy cartridges at Home Depot. 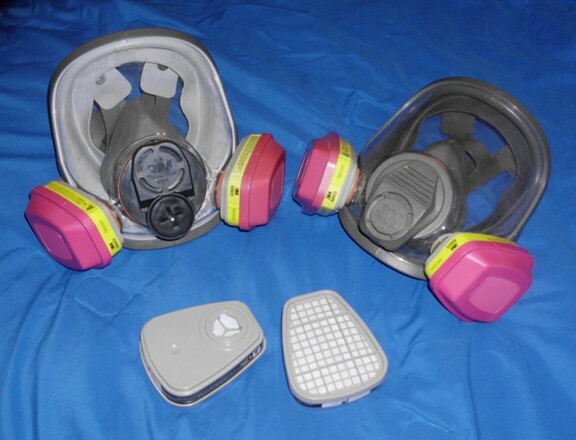 I have the 3M full face respirators and the N95 cartridges are readily available. In the picture you can see mine and my son's (small and medium) with the acid gas cartridges. They're overkill (we're drag racing fans and the pink cartridges filter out the exhaust fumes) but they're rated as N100 filters. In front are the N95s - the part number on the cartridge is 6001. They also do regular N99 and N100 cartridges which filter 99% and 99.97%. Not sure of the availability on those though. I'll let you know if I find any, as those would be the ones I'd be inclined to go with. Good move JD on the patent. It's hard to believe that it all came down to Rishatt's blood for the vaccine, and ownership rights. I'd rethink those type filters for use as biological filter. While they are particulate particle filters they were NOT designed for biological filtration use. Since they are not designed for or tested against biological agents no data can say that they indeed work and are safe for use in a biological environment. Instead I'd use C21A filters or similar such NBC filters that were designed exactly for just such use. Of course that would mean that those masks are not going to work either as they do not except 40 mm NBC filters. So what mask takes the NBC filters? Jacksdad thanks for the info will look into it. Lopper - I hear what you're saying, but to be honest the plan is not to go out at all if it gets really bad. I shouldn't have to go out if my preps hold up, and if I do, I certainly won't be rubbing shoulders with anyone if I can help it. I know that the 3Ms are not certified NBC respirators, but my main concern would be a virus piggybacking on droplets and aerosols - both of which can be mechanically filtered. The N100 cartridges filter out 99.97% of airborne particles which would give me a considerable edge over the vast majority of people that'll be stuck with surgical masks at best. And N100 is still N100 whether it's mask, respirator or gas mask, and the particulate/aerosol filtering properties are the key consideration for me. I guess in using them we've already tested them at least as well as the military does. The exhaust gas that Top Fuel dragsters churn out is pure nitric acid vapor (and lots of it) and while the people around us not wearing respirators are often blinded and literally unable to breathe, we never even get the slightest whiff of gas even when it's so concentrated that we're standing (alone) in a thick brown cloud of the stuff. I know the military often uses vanilla scent to test the fit and filtering capability of respirators, but I bet pure nitric acid fumes would trump vanilla every time. And being a gas it reaches places that aerosols and particulates never could, so I'm confident in their ability to keep out solid particles. It's not my only prep in this respect - I also have about twenty good N100 masks with exhaust vents, about thirty vented N95s, and a couple of hundred unvented N95s. P.S. I had to try the vanilla test to satisfy my curiosity - and then I had to explain to my wife what I was doing in the kitchen with a full face respirator and a bottle of vanilla extract. I blocked one cartridge while I placed the bottle next to the other and took a few deep breaths. Good news - couldn't smell a thing and that stuff's pretty pungent. "Love your patent...want some as soon as you put it on the market..."
If you are looking at 3M masks the filter you want is called an ABEK-P3. As Rickster posted, there are other manufacturers that have NBC filters if you want to go that route. My advice would be to check out eBay as you can pick up respirators there, both new and used, for a lot less than retail. I needed one for my son and ended up buying an unopened box of four respirators for less than the retail on one. Make sure you get one that works with the cartridge you intend to use though. The ABEK-P3 NBC filter has a 5 year shelf life as opposed to the C2A1 NBC filter which has a 10 year shelf life. Something to consider when purchasing NBC filters. Yeah I hear ya if it comes down to it and it gets bad I'm with you as I won't be around anywhere where I would need a filtered mask. That being said in the unlikely event I did have to go into an area I knew was infected for whatever reason, I'd like to know my gas mask filters were good to go and up to the task without any doubt at all. Just wanted to put the information out there for those who might not know better. I have used negative pressure masks in my occupation in toxic environments and do have training in the proper use of filtered masks and have take the 40 hazmat as well as various NBC military training courses so I do have a fair amount of knowledge in the subject matter. Oh and every fit test I have ever had did not use vanillas but CS gas but the principal is the same. Lopper - with your training, feel free to chip in anytime. Expertise is definitely welcomed here. I just did a search (because my son's respirator has an optional DIN port) and 40 mm NBC cartridges do fit the 3M 6000 series respirators.